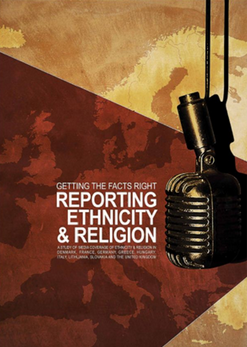 ﻿ Twenty Years of MDI: What is the Media's Role in Reporting on Religion During the Populist Era? Belgian journalist and long-time friend of Media Diversity Institute Jean-Paul Marthoz moderated the discussion between Auckland University of Technology’s Verica Ruper, Human Rights League Director Pierre Arnould Perrouty, French journalist and Rue89 co-founder Pierre Hasky and US-based reporter, and religion expert Kimberly Winston. Later, the European Commission’s David Friggieri responded to the panelists points, and added a few of his own. Ruper—who authored Getting the Facts Right: Reporting Ethnicity & Religion in collaboration with Media Diversity Institute—gave an overview of the history of reporting on religion, saying that while the 1970s and even 80s saw religion relegated to specialized pages and publications, our global climate sees religion on the front pages, with stories about rising Islamophobia and antisemitism. Kimberly Winston—a veteran religion reporter—seconded her analysis, stressing that the current climate needs religion experts to explain where major stories, ranging everywhere from the 9/11 terrorism attacks to the rise in Christian militancy, and opposition to political issues such as LGBT marriage and abortion rights, come from. 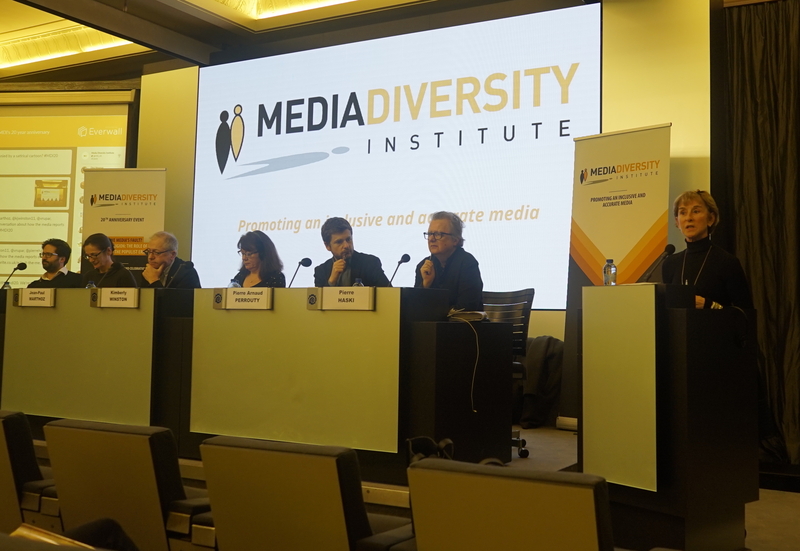 French journalist Pierre Haski said that, one issue in France is the lack of diversity in French newsrooms; almost everyone identifies as secular. In his analysis, this meant that French journalists struggled o cover major stories, such as the Charlie Hebdo attacks or the astonishing number of young French Muslims that traveled to Syria to join the Islamic State. Pierre Arnould Perrouty added that many of the experts these journalists quote are also from a similar background, resulting in a complete lack of religious voices in the French media. Naturally, hate speech came up—particularly the issue of whether to censor or legislate social media content. For Winston, who comes from the American perspective of upholding the first amendment above all else, she recommends journalists to report on hate speech, but contextualize it; in her opinion, this explanation pushes the conversation forward. Friggieri, who has sat down with some of the major technology companies to devise a solution to this problem, advanced the idea that “codes of conduct” are a possible means to move forward in a way that respects freedom of expression, while putting down a red line at content that incites hatred and violence. There wasn’t nearly enough time to answer all of the questions—including excellent ones, such as whether or not a journalist should be secular in order to be fit for the job, and how hate speech should be controlled and regulated in public media, as well as social media. We are already planning the next panels on religion and the media, and hope you will join us at those, as well. In the meantime, please continue the conversation with us on social media, and let us know what you would like to see discussed when it comes to the topic of religion, media and diversity.